The Renegade Craft Fair is a free-to-attend event showcasing the handmade work and wares of independent craftspeople, artists, and designers nationwide. Vendors appearing in the fair come from an ‘indie-craft’ background, Do It Yourself (DIY) culture, or have an interest in the contemporary ‘craftivism’ movement. Beginning in 2003 in Chicago, The Renegade Craft Fair is a juried handmade marketplace featuring hundred of artists at a time, including those working in ceramics, fibers, printmaking, wood-working, jewelry, and fashion design. The event presents a high-profile opportunity for emerging makers of affordable handmade goods to showcase and sell their work in person in a highly attended public venue. 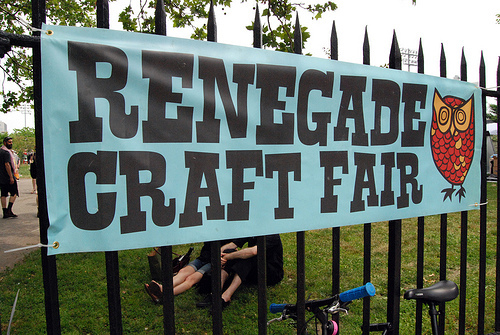 The concept for The Renegade Craft Fair sparked for festival organizers upon realization that no other art and craft festival adequately represented (in scope and scale) the creativity of the burgeoning indie-craft and DIY-ethic movements gaining momentum on various websites and online stores throughout the ’00s. As Assistant Director, I primarily functioned as the main contact point for a rotating roster of handmade artisans nationwide, providing mentorship and information to 100s of participants at a time. Additional duties included the curation of marketplace layouts, scouting of venues, and development of interactive and educational crafting workshops with nationwide or city specific partners, including international organizations like Etsy and BurdaStyle, as well as local organizations like the Museum of Craft & Folk Art in San Francisco and The Urban Craft Center in Los Angeles. I also helped develop music and performance components into the events by partnering with retailers (Amoeba Music), radio stations (KXLU, KVRX), and entertainers (Mucca Pazza, South Shore Drill Team), and often represented the organization in interviews and public events. Lastly, I was responsible for fundraising and fostering strategic relationships with sponsors and advertising partners (Juxtapoz Magazine, Uppercase) across North America, heightening the Fair’s profile and helping cover overall production fees. View select artists, partners & clients. View images from previous Renegade Craft Fair marketplaces.